December 14, 2009 - Hawaiian Airlines and the International Association of Machinists and Aerospace Workers – Clerical Division (IAM-C) announced a tentative agreement on a new four-year contract that would provide increased compensation for Hawaiian’s largest single work group as well as operational improvements for the company. The tentative agreement covers 1,245 employees in airport customer service, ramp, reservations, schedule planning, purchasing, records and crew scheduling positions at Hawaiian. The agreement is subject to ratification by union members, who are expected to vote on the proposal in the coming weeks. Hawaiian has reached similar agreements with its flight attendants’ union, the Association of Flight Attendants (AFA-CWA) and its dispatchers’ union, the Transport Workers Union (TWU). Hawaiian Airlines now in its 81st year of continuous service for Hawaii, Hawaiian is the state’s biggest and longest-serving airline, as well as the largest provider of passenger air service to Hawaii from the state’s primary visitor markets on the U.S. mainland. Hawaiian offers nonstop service to Hawaii from more U.S. gateway cities (10) than any other airline, as well as service to the Philippines, Australia, American Samoa, and Tahiti. 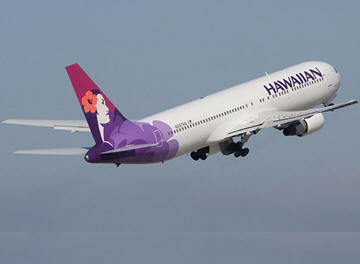 Hawaiian also provides more than 160 daily jet flights within the Hawaiian Islands. Hawaiian Airlines, Inc. is the 11th largest commercial airline in the United States. It is the largest airline based in the State of Hawai'i. Hawaiian Airlines, based in Honolulu CDP, City and County of Honolulu, operates its main hub at Honolulu International Airport and also operates a secondary hub out of Kahului Airport on the island of Maui. Hawaiian Airlines is owned by Hawaiian Holdings, Inc. Mark Dunkerley is the President and Chief Executive Officer of Hawaiian Holdings. Inter-Island Airways, the forerunner of the airline which is now known as Hawaiian Airlines, was incorporated on January 30, 1929. Inter-Island Airways, a subsidiary of Inter-Island Steam Navigation Company, began operations on October 6, 1929 with a Bellanca CH-300 Pacemaker, providing short sightseeing flights over Oahu. Scheduled service began a month later on November 11 using Sikorsky S-38s with a flight from Honolulu to Hilo, via intermediary stops on Molokai and Maui. On October 1, 1941, the name was changed to Hawaiian Airlines when the company phased out the older Sikorsky S-38 and Sikorsky S-43 flying boats. In 1966 jet travel started with the acquisition of Douglas DC-9 aircraft, which cut travel times in half on most of the routes. In 1984 the company began to operate charter services to the South Pacific using Douglas DC-8 aircraft, and soon added Lockheed L-1011 aircraft to the fleet for West Coast services. As the west coast market grew, the South Pacific market shrunk, and service was reduced when the company's DC-8s were retired in 1993; and when the L-1011s were replaced by the McDonnell Douglas DC-10 in 1994. The DC-10s were obtained from American Airlines, who continued to provide maintenance on the aircraft. An agreement with American also included converting to American's SABRE reservation system and participation in American Airlines' AAdvantage frequent flyer program. The DC-10s were retired between 2002 and 2003. The company replaced these leased DC-10s with 14 leased Boeing 767 aircraft during the fleet modernization, and replaced the DC-9s with Boeing 717 aircraft. Hawaiian's original 1975 Pualani logo, designed by Landor Associates and introduced on the McDonnell Douglas DC-9-50. Hawaiian Airlines filed for Chapter 11 bankruptcy protection on March 21, 2003 with operations still continuing, and at the time was overdue for $4.5 million USD worth of payments to the pilots' pension plan. Within the company, it was suggested that the plan be terminated. As of May 2005, Hawaiian Airlines had received court approval of its reorganization plan. The company emerged from bankruptcy protection on June 2, 2005, with reduced operating costs through renegotiated contracts with its union work groups; restructured aircraft leases; and investment from RC Aviation, a unit of San Diego-based Ranch Capital, which bought a majority share in parent company Hawaiian Holdings Inc in 2004. Hawaiian has never had a fatal accident in its entire history and is the oldest US carrier with such a distinction (the other airlines in this group have been in business less than 40 years). Hawaiian Airlines was the number one on-time carrier in the United States from November 2003 until November 2006, when rival Aloha Airlines took the number one spot, pushing Hawaiian to a close second. The airline has also frequently been number one in fewest cancellations, baggage handling, and fewest oversales. Hawaiian Airlines has been rated the best carrier serving Hawaii by Travel + Leisure, Zagat, and Condé Nast Traveler. On May 4, 2006 Hawaiian Airlines announced expanded service between the U.S. mainland and Hawaii in anticipation of the induction of four additional Boeing 767-300 aircraft, primarily focused on expanding non-stop service to Kahului Airport from San Diego, Seattle, and Portland. Additional flights have also been added between Honolulu and the cities of Sacramento, Seattle and Los Angeles. On July 24, 2007 Hawaiian Airlines and Air New Zealand signed a $45 million contract for Air New Zealand to perform heavy maintenance on Hawaiian's Boeing 767 aircraft. The contract is to last for five years. Air New Zealand stated that this opportunity will also give a chance for them to build their expertise working on 767s. On August 27, 2007 the airline announced plans to launch flights to Manila in the Philippines. Hawaiian Airlines said it will begin nonstop service to the Philippines in March 2008, in the first major international expansion since it emerged from bankruptcy protection in June 2005. In response to the closure of ATA Airlines and Aloha Airlines, the airline announced new flights to Oakland beginning on 1 May 2008. In August 2007 the Seattle Seahawks announced that they would be flying on Hawaiian Airlines for the upcoming National Football League seasons. This marks the second team that Hawaiian Airlines will be flying. The Oakland Raiders of the NFL have also been flying Hawaiian Airlines since the 1990s. The two teams fly on Hawaiian's Boeing 767s to and from all their games. Two of Hawaiian's Boeing 767 aircraft have been fitted with decals of logos from the Seahawks and the Raiders. At the beginning of the 2009 NFL season, Delta Air Lines replaced Hawaiian as the operator of the Seahawks charter flights.